The Unextraordinary Gentlemen's talk about their story-telling songs, and the unique world in which they're set. The Unextraordinary Gentlemen are based out of Los Angeles, CA. They created the world of God-Only-Knows, and tell its stories through their songs. They recently released their full-length album, The Stars Pulled Down. Who's who? (J) is Jennifer Pomerantz, violinist. (R) is Richard Pilawski, bass player and programmer. (E) is Eric Schreeck, vocalist/lyricist. , are the stories stand-alone or part of a larger world? (E): It's all in the same world. I'm slowly trying to make it seem like one thing, trying to decide on the back story. I'm working on short pieces of fiction to bring to the website, as stand-alone short stories to show people where I'm actually trying to go. We're encouraging people to check out the Unextraordinary Encyclopedia on our website (http://unextraordinarygentlemen.com/u-e/u-e.html). It's all part of the same imaginary world. SP-M: When did you come up with this world? (E): Right after Richard and I decided we were going to be called Unextraordinary Gentlemen. Ok, well, I'll start writing the songs from different characters points of view. more in the style of story-telling. I started to put it together like I'd write any story. I came up with a setting, and characters, and circumstances for them to get in, then boiled them down to 3-5 minute songs. SP-M: What's your writing process? Does the story or the music come first? (E): For the most part, Richard will have some music. It's either a little bit done or a lot bit done --yes, that's a new word. Then he'll present it to me, or to all of us together. Meanwhile, I'm building on this world, more stories for the characters to get into. I write the lyrics separately. If the music works, it makes the songwriting a lot quicker. The more challenging songs take a little more work. Richard writes a part or two, then I try to write lyrics that fit with the music, based on ideas we already have. Then Richard builds on that, adds more violin parts. We'll make a song that starts out as three or four little ideas, and make them into a big idea. That happened with "Skeleton Goes to Town"
", and "Ants Under Glass." Those songs that took a little more work. (R): For "Worst Of All"
That sounds awesome! We could use that. That's what you hear, at the very beginning of that song. We built a song off of that. SP-M: What's next for Unextraordinary Gentlemen? (E): We're getting together our record release party in the Los Angeles area. As far as music and ideas, we're still working on rebuilding our website, and I keep coming up with new entries for the encyclopedia and the fiction. As the band, we're starting to think about writing some wintry songs for next year. That's in the idea phase--that's the twinkle in our eye. We want to encourage people to listen to the new album, and let us know what they'd like to hear and see from us, if they have any ideas. We may not take any of them or all of them, but you never know. SP-M: Have you incorporated listener suggestions? (E): As far as taking suggestions from the listeners, I don't know if we've done too much of that yet. We enjoy when we occasionally see someone write a short story, interpretation of one of our songs. What it means to the listener is more important, because they're not personal songs. We're not trying to change the world with a big political message. They're open to interpretation. SP-M: What's the status on the music video for the "Old No. 9"? (E): We've been on a little bit of a break. We're doing location scouting. I've written a treatment and have talked with the other gentlemen about it. We have 2 EPs and the second album out now, but we don't have anything visually for people to see. I like that people have to use their imagination, but I also would like to put out a music video. It will give them an idea what our vision for a particular song is, and help them understand us better, what kind of band we are. SP-M: How did you end up playing Steampunk music? graphic novels. Then I read the Victorian novels it's based on, like War of the Worlds. There wasn't really a scene, as there is now. We were doing our own thing. It kinda happened, organically. We built our own universe to tell our songs. Our interests are Nick Cave and Tom Waits. Nick Cave has more fictional stories than Tom Waits... we wanted to have our own kind of world to sing about. We are fans of the genre. We do a weird little art band that has that kind of world too it. (J): Then we got sucked into it. We ran into Josh of Vernian Process. He had a live band going, and there were a lot of conventions going on. There were makers and costume stuff, but music wasn't at the forefront. We got kinda pulled into it--we didn't really set our sights on it. (E): We are not strictly Steampunk. We're also an electronica band, a punk band. I think that we are a band that plays music that has a narrative and electronic components, and organic components. That's essentially what we are. Whatever other labels we fall into, I'm fine with any of them. So, yes, we are a Steampunk band and no, we're not a Steampunk band. We definitely fall into that category. What we were doing, unknowingly, was doing the Steampunk thing, under that definition. But that wasn't our intention. Not to compare ourselves to them, but it's like The Cure being considered a goth band. I doubt that we're going to shy away from the pseudo-Victorian era. So, as long as Steampunk falls under that definition. . .Steampunk is expanding into Dieselpunk, into the 1920s and 1930s. Or far futures that have gone back around, and the technology has come back as Victorian. SP-M: Do you think Steampunk will enter the mainstream? (E): Elements are showing up in Lady Gaga, Justin Bieber, and Nicki Minaj performances. Pop culture is borrowing bits and snaps from the Steampunk culture. Some people are afraid of that. I think it's more that they have fashion and video editors that see something that they thought was cool and applying that to their artists. It's not a concentrated effort to make Steampunk generic. It's a burgeoning, growing subculture, but in no danger of becoming de-marginalized anytime soon. I see some of the bands and some of the fashioneers and some of the craftsmen. Some of these people were known outside of Steampunk. Just like anything, it takes a lot of effort, a lot of passion, a lot of honesty and a lot of luck. SP-M: Are you planning to tour in the near future? (E): Right now we're playing in the Los Angeles area, and some other places in California. We're concentrating on our official CD review party. We do get a lot of offers. (R): California is a huge state--it's hard to get out of it. We've been playing with the idea to head to the East Coast. We might look into Dragon*Con. It's a really big deal. Follow the Unextraordinary Gentlemen at their official site http://unextraordinarygentlemen.com/, or on Facebook--http://www.facebook.com/pages/Unextraordinary-Gentlemen/67582267305. 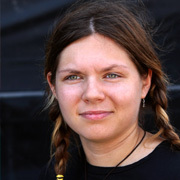 Katya Ivanov is a freelance writer, occasional screenwriter, and fabricator of accessories. She talks for a living as an announcer for a public radio station. She loves conversations with intriguing people and, with permission, shares them in her interview work.